The journey from darkness to light; from death to life; from crucifixion to resurrection -- the stone is rolled away. Let us not spend this holy week brooding on the crucifixion of God’s Son, but happily in the celebration of his release. For Easter is the sign of peace, not pain. The Miracles Healing Center in Wisconsin Dells, WI, will be hosting an eight-day intensive Easter retreat beginning Palm Sunday on April 1st and continuing through Easter Sunday on April 8, 2012. 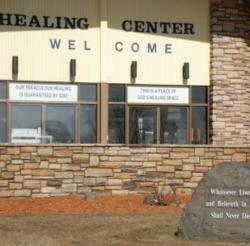 The event entitled “Rolling Away The Stone,” will take place in the Healing Center Sanctuary on Highway 23 at County B in Wisconsin Dells, WI. In announcing the retreat,Miracles Healing Center director, Reverend Peter Bonnes explained that the event offers an opportunity for participants to immerse themselves completely in the incomparable healing energy of Love, emanating in the Center, without the petty distractions that usually attend temporal human existence. Reverend Bonnes continued, “Our instructions come from Jesus Christ in his unworldly masterpiece, A Course In Miracles, and is stated thus: 'Let us not spend this holy week brooding on the crucifixion of God’s Son, but happily in the celebration of his release. For Easter is the sign of peace, not pain. A slain Christ has no meaning. But a risen Christ becomes the symbol of the Son of God’s forgiveness on himself; the sign he looks upon himself as healed and whole. 'This week begins with palms and ends with lilies, the white and holy sign the Son of God is innocent. Let no dark sign of crucifixion intervene between the journey and its purpose; between the acceptance of the truth and its expression. This week we celebrate life, not death.